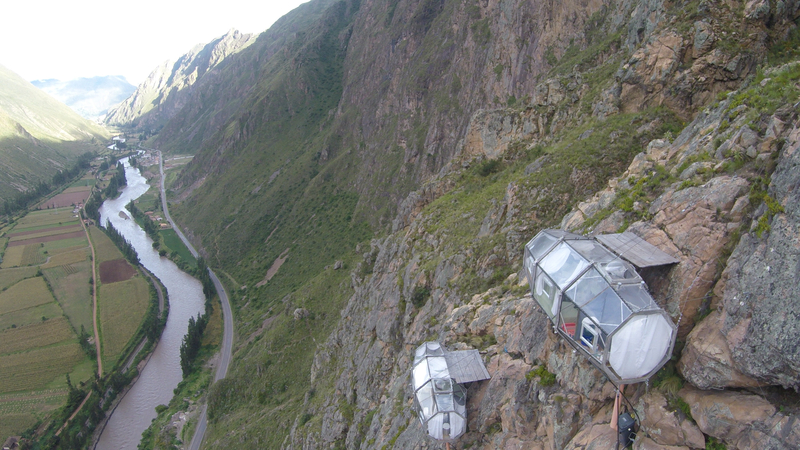 The Place: The Skylodge Adventure Suites listed on Airbnb located in Cusco, Peru, are three transparent capsules that hang 1,312 feet above the ground from the cliffs of Mt. Via Ferrata. 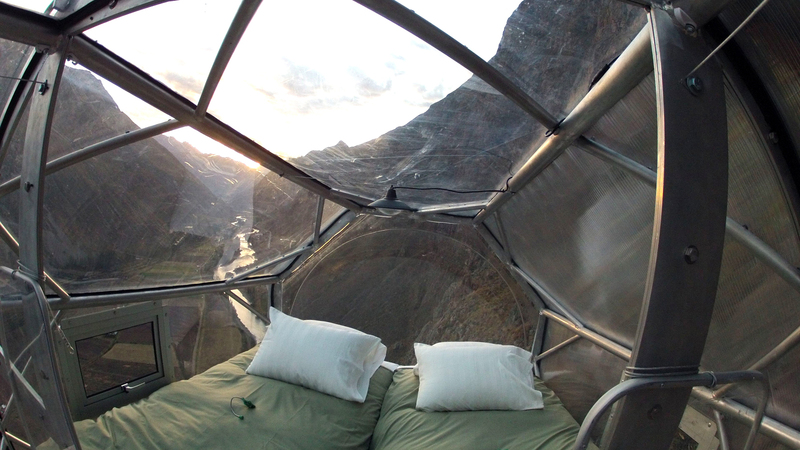 Spending a night in these six-windowed capsules handcrafted from aerospace aluminum and weather-resistant polycarbonate gives you a 300-degree view of the Sacred Valley. Twenty-four feet in length and eight feet in height and width, each capsule includes a bathroom, dining area, four beds, and solar-powered lights. 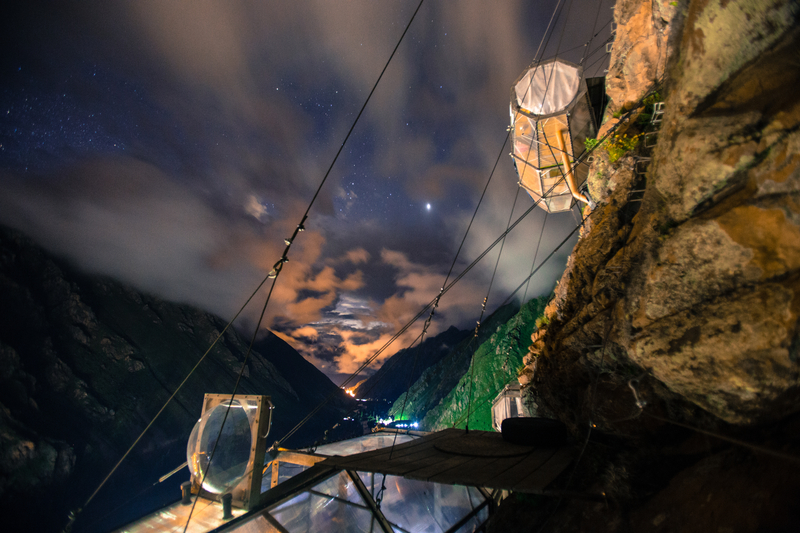 If you don’t want to climb the whole way to the capsule, you also have the option of hiking trails equipped with—yes—zip lines. Each stay includes guides, transportation from Cusco, a gourmet dinner (including wine), and breakfast. The Cost: Spending a night in the capsules can start at $464/per person. The Region: The Scared Valley of Cusco in the Southern Highlands of Peru near the Andes Mountain Range is known for its strong ancient Incan civilization and culture. There are many different historic villages and sites to explore, including the famous ruins of Machu Picchu, which is just a short 23-mile trip from the Skylodge. Ollantaytambo, one of the most well-preserved Incan towns in Peru, is just a nine-minute car ride away. Get a tour of some of the original buildings built from stone and mud, and soak in the sights of a village that has held onto its traditional roots into modern times. For adrenaline junkies, Action Valley is a 20-mile trip away and is famous for its bungee jumping and the highest slingshot in the world. And that bungee jump is renowned for good reason: thrill-seekers will enjoy a 400-foot free fall (the highest in South America).